Darrell Etherington for TechCrunch: Sony is investing in Acutronic Robotics‘ Series A round, via its Sony Innovation Fund. 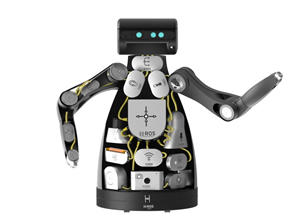 Sony will also adopt Acutronic’s Hardware Robot Operating System (H-ROS), for use in its own robotics division, the company says. This funding follows investment by DARPA in Acutronic’s platform, which aims to become an industry standard for robotics components from across hardware and software providers. Acutronic was set up in 2016, and offers a way to allow components combine in new robotics systems easily with ready-made compliance with industry and commercial standards for easy deployment. The idea is to take out some of the more complicated base level steps towards deploying robotics in industry and the workplace, with a focus on building robots that are both reusable across applications and reconfigurable to suit different purposes. MICROMO launches the new MC3/MCS motion control family. The new high performance, intelligent controllers are optimized for use with FAULHABER motors, offer electronics for simple operation with state-of-the-art interfaces for multi-axis applications, and provide a motion control system solution with the most compact integration into industrial grade housing.